Almost 150 roads and bridges in Cumbria still need to be fully repaired in the wake of 2015's Storm Desmond. The county council said a "huge amount" of work had been needed. Some 830 projects have been completed - the latest being the road between Gaitsgill and Raughton Head, near Carlisle, which has just reopened. A further 115 schemes are in progress, but 32 are yet to start. The work will continue into next year, said the authority. Keith Little, the cabinet member for highways and transport, said the council was working to repair infrastructure damaged by floods in 2009 when Storm Desmond wreaked further havoc. "Because there was a huge amount of work to be done and we have the day-to-day maintenance of the country's roads to continue, at the moment we have about 115 projects in progress. "We will continue to work into the early part of 2020." Talking about the reopening of the Gaitsgill and Raughton Head road following a landslip, Mr Little told BBC Cumbria it had been "a fairly big job". "The length of time [taken] has mainly been around assessing the damage. "It was decided to move the road some 20m (65ft) away from the river so we had land owners to deal with and legal issues," he said. Repair work following the December 2015 storm has cost about £86m, the council said. 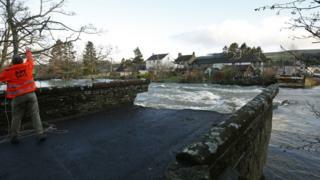 Burneside, near Kendal, is among the areas still affected. The bridge in the village is due to reopen next month, following repairs. People currently face a six-mile diversion to get from one side to the other. Businessman John Seward said: "It's really quite difficult. It's like a take of two cities, or two broken halves. "People are not passing through. It's like a ghost village".